Honeybush tea is a beverage derived from plants in the Cyclopia family, and is regarded for its potential impact on health. The beverage is sweet tasting and has a history of use as a folk remedy, with recent scientific evidence supporting some the tea's purported effects. Regular consumption of the tea is associated with several long-term and short-term health benefits, making it an excellent alternative tea choice. Honeybush tea is a natural source of many antioxidants, including major phenolic compounds. Phenolic compounds play a significant role in protecting the immune system from oxidative stress, which could damage cells, according to a 2013 review published in “Nutrients.” Phenolic compounds also modulate the immune system, which helps the body’s natural defenses against infections. This may be responsible for the belief that honeybush tea is effective in relieving colds, influenza and other diseases. Evidence also exists that the phenolic compounds in honeybush tea are able to reduce inflammation and prevent the development of chronic inflammatory diseases. Phenolic compounds have a direct effect on down-regulating the body’s inflammatory response, as demonstrated in inflamed intestinal cells similar to those seen in inflammatory bowel disease, according to a December 2010 study published in “Chemico-Biological Interactions.” This makes honeybush tea effective in providing short-term inflammatory relief as well as helping to prevent or ameliorate inflammatory diseases like IBD or Crohn's disease. 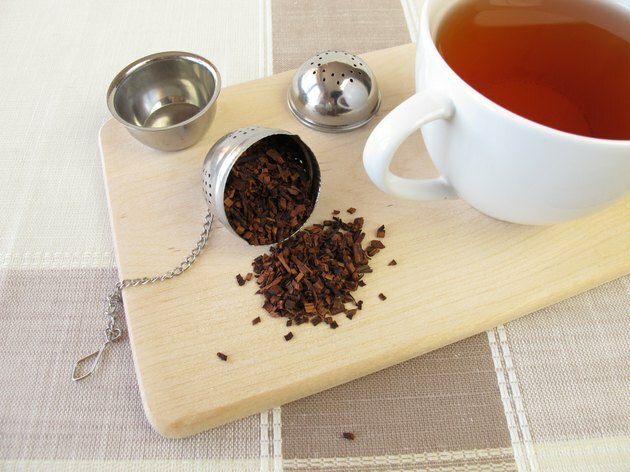 Honeybush tea has phytoestrogenic properties, making it behave like estrogen in the body, according to a 2006 study by researchers at the University of Stellenbosch. Phytoestrogenic activity, combined with anecdotal evidence, suggests that honeybush tea is effective in relieving menopausal symptoms in women. The phytoestrogenic attributes of the tea may also be useful in protecting the body against osteoporosis, heart disease and certain hormone-related cancers.